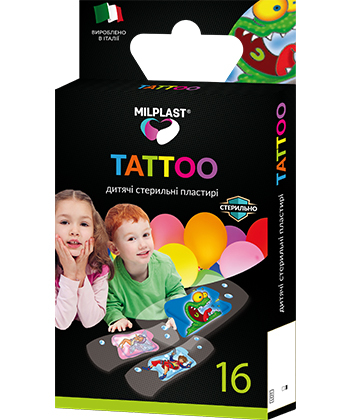 Milplast Tattoo sterile plasters for kids are developed specially for children. It reliably protects abrasions and cuts of your kid against further irritation. Colorful pictures reminding tattoos surely deflect attention from pain and set the cheerful mood. Plasters are hypoallergenic and can be applied on any skin area. Milplast Tattoo are removed painlessly, which is important for kids, and without remains on the skin.